If you read the Whole30 book, it gives you insight into what you can expect from the four weeks you do the challenge… two of which include sugar withdrawals and a carb flu. I had very real hangover symptoms for about four days: I woke up with bad headaches, a little nausea (never got sick though), I was light-headed, and a little weak. It’s crazy to think how addicted your body becomes to something as simple as food! I read my labels carefully now. You’ll be surprised how much “healthy” brands sneak in additives, sugars and syrups, corn, etc into products you thought were good for you… or at least better for you than the real thing. Unless I’m really in the mood for bad food (like last week when I had tonsillitus), I read my labels very carefully and generally avoid anything processed throughout the week. I’ve always known whole foods are better for you, but now it’s changed my whole perspective. I know I have the willpower to avoid sugar. When I first started Whole30, drinking my coffee with just unsweetened, non-dairy milk was truly torture. As the weeks went on though, I found I had acquired the taste for it and I no longer need that packet of Splenda I used to add to my cup every morning. I also know I can live without having fro-yo, a cookie, or candy every day. Instead, when I crave something sweeter now I grab fruit. I still plan to have sweets on special occasions – birthdays, maybe weddings, etc, but otherwise I’m going to try to stick to the fruit-for-dessert rule. Because of all the sugar I used to eat, I was always worried about the calories I was consuming elsewhere. Now I eat those calories in my meals (more real food!) instead of in my sugar intake. I don’t miss the bread, I miss the cheese. Sure, I do crave pasta, pizza, and the like from time to time, but it’s the lack of cheese that really threw me off. I use cheese like I do spices: for seasoning and adding flavor to my favorite recipes… I don’t eat cheese super often, but I do like having the option to sprinkle it on my cauliflower “pasta” and on egg dishes like this one I whip up. As far as carbs go, I am all about alternatives – mostly, I use cauliflower! Like I mentioned above, I make this cauliflower “pasta” a lot, and now that I’m done with Whole30 and can have cheese again, I’ll be making this pizza again too. I’m going to continue avoiding carbs (again, unless it’s a special occasion), but I’ve definitely brought cheese back into the mix. Meal prep and cooking things ahead is EVERYTHING. One of my biggest discoveries that I will continue to follow is doing a lot of meal prep and cooking meals ahead. This saved me on days where I was too busy, tired or just plain lazy! While I do have a somewhat flexible schedule and certainly have time to cook, it’s just too hard to keep up with doing every single night! And keeping the kitchen clean was an absolute nightmare. Instead, I started making 2-3 meals in one night and storing them in the fridge for the following few days to eat for lunch and dinner. I did this with the Turkey Tacos, Macadamia-Nut Chicken, and any other meat dishes that could be chopped up and put on salads, eaten with lettuce wraps, etc. I also relied on a few different egg muffin recipes and this chia pudding recipe so I’d have breakfast ready to go without any prep required each morning. It made staying on track a breeze, and I was able to do all cleanup at once! Eating more meat helps keep me full longer. Before Whole30, I ate pretty healthy most of the time. With the exception of the holidays and travel, I eat a lot of vegetables and fruit… I was eating meat and fish occasionally, but only about twice or three times a week. I like meat, it’s just never been something I crave. If you’re not familiar with the Whole30 rules, protein is the focal point of every meal. Whole30 requires you to have a significant portion of protein for breakfast, lunch and dinner. Even with the removal of sugar from my diet, the amount of protein I added definitely made up for that lack of calories. I’m thinking this is why I didn’t lose a whole bunch of weight on Whole30. I’m eating the same amount (or more!) of calories every day, but those calories are just coming from different, good-for-you foods. I also discovered that this added protein kept me full longer! I don’t really need to snack. I’ve always been a snacker. I love all kinds of snacks: chips, candy, veggies, crackers and cheese, etc. I like it all! Especially working from home in front of the computer all day, it’s so easy to mindlessly snack throughout the day. One of the things Whole30 teaches you is to avoid snacks and just stick to three satisfying meals each day. At the beginning I really struggled with it, but now I’ve trained myself and generally don’t reach for anything in between those meals. If I have a pang of what I think is hunger, I’ll grab a La Croix which generally satisfies that urge – Whole30 says most of the time when you think you’re hungry you’re actually just thirsty. Replace that snack with a bottle of water of can of La Croix! I (re)discovered soooo many great spices. Even though I cook A LOT, I still tend to get in food ruts because I can get sick of cooking the same things over and over again. For some reason, I’ve never done a bunch of experimenting with flavors and spices, but with Whole30 it opened up my eyes to so many I’d been missing! I’m now getting more familiar with new spices and rediscovered my love for others that have been sitting in my pantry. It makes the cooking process more fun to test out new spices, and my meals are way more flavorful! The simple recipes are the best recipes. Do you ever find recipes online and want to make them until you see the ingredient list is a mile long? This happens to me all. the. time. While I don’t mind the meal prep part of it, it’s more the idea that I have to buy the whole grocery store to make the actual recipe. While I enjoyed most of the meals I made throughout Whole30, the ones that were the simplest to make and required the most minimal amount of ingredients were the ones I made again and again. I felt like I wasted less food this way and didn’t dread visiting the grocery store as much. Less to look for, less to pay for! 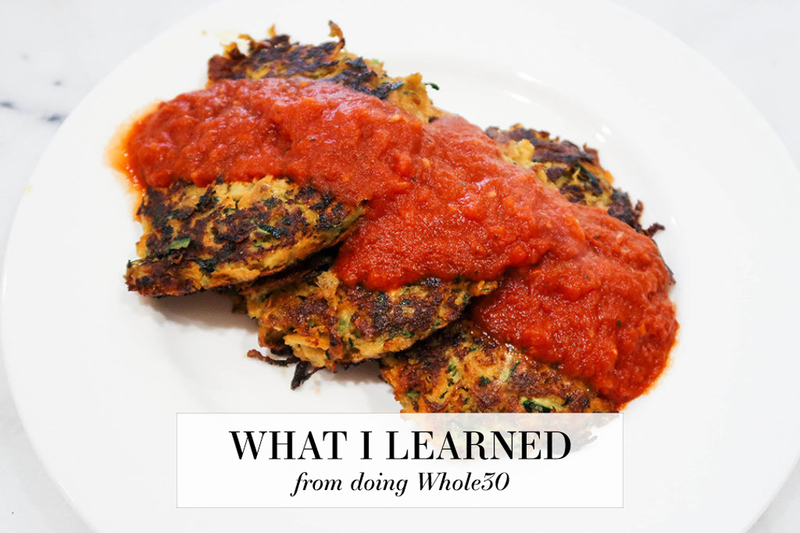 You can check out my favorite recipes I tried during Whole30 here. I know the process is to illuminate sugar intake, but about how many grams of sugar are you allowed to have? i looked through most of the labels and found that some things even still have 1g. Is that still ok? Thanks for reaching out! It’s not so much about the actual grams in something – look at the actual ingredients. If it features any added sugars: cane sugar, corn syrup, honey, maple syrup, stevia, coconut sugar, etc, it’s not allowed on Whole30. Fruit has natural sugars in it, but it is allowed on Whole30. Does that make sense? Just make sure you’re reading the ingredients part of the label, not necessarily the nutrition facts! I loved following your journey on this!! My sugar addiction is so real and I really need to get it in check. Thank you for sharing so many good takeaways! The sugar addiction is the reason why I decided to do 30 whole. I could give up everything except sugar and now I can. I am afraid to eat any sugar because I may not be able to stop myself. Any suggestions? I’m doing the same! I am just avoiding all desserts and added sugars – I don’t put sugar in my coffee, and if I’m craving something sweet I always go for fruit (either sliced fruit or some kind of smoothie). That definitely helps me! Whole 30 really killed my sugar cravings- in a big way???? I’m still amazed ! Amazing what “healthy foods ” include as ingredients!! !